Being physically active is good for your body, mind, and spirit. In a world of digital everything, it is easy to spend your entire day staring at screens, barely moving at all. The good news is that here in the hill country of Texas, staying physically fit doesn’t have to be a chore. As your local primary care physician serving Bee Cave and surrounding Austin communities, we are passionate about ensuring the whole family stays healthy. 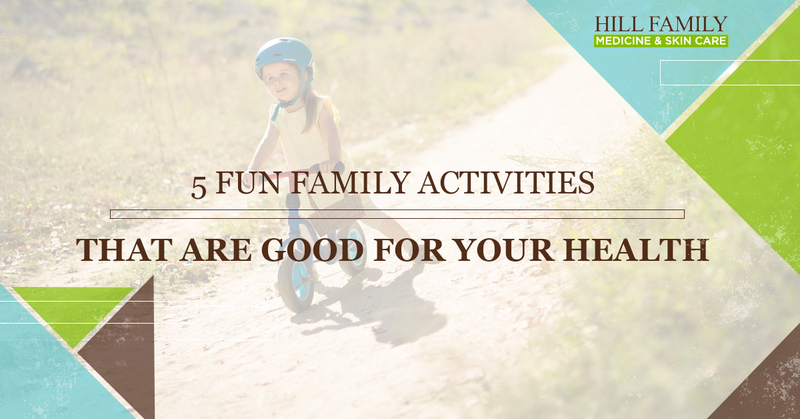 Check out these five fun activities that everyone in the family can enjoy and get everyone off the couch for some enjoyable physical fun. Perhaps one of the very best parts about living in the hill country is that we are surrounded by gorgeous natural bodies of water. From the massive waters of Lake Travis to the frigid pools of Barton Springs to the roaring falls of Hamilton Pool, there are countless locations nearby that provide a refreshing place to head even on a hot Texas day. The good news is that not only will you enjoy the gorgeousness of a day on the water, but you will also help your family stay fit. Swimming, fishing, hiking along the shoreline, and playing games at the lake are all excellent ways for everyone to stay fit. The best part is that the whole family can enjoy a day on the water. Ditch the computer screens and plan a few trips to nearby water destinations. If you need some inspiration and you are looking for affordable waterfront getaways, check out the Lower Colorado River Authority’s (LCRA) website. Here you will find a comprehensive list of amazing places to spend a day kayaking, swimming, and experiencing the best of our rivers. LCRA makes it easy for families to afford to utilize these parks as well, with many entrance fees as low as a few dollars. Your daily schedule is probably pretty hectic, which can make it hard to fit in family fitness time. However, getting in some physical activity each day doesn’t need to be elaborate. One very simple yet highly effective method for improving your family’s health is to start making evening walks a family tradition. Each evening, after dinner, ditch the television, grab Fido, and head out for a quick walk. This is a great time for the family to catch up on daily activities and share stories, all while staying fit. Start small. If no one is enthused about a walk, make it a short 10-minute activity. As everyone adjusts to the evening ritual, you can increase the length of the walk. When you have a free weekend, what do you and your kids tend to do? If the answer is sit around the house, make it a point this year to implement a hike once a month. There are countless locations in the hill country for a gorgeous hike, many right out our own backdoor. Weekend hikes get everyone away from the couch and back into nature. Starting your kids young will help them develop a love for hiking from an early age. Pick small hikes to start and choose a challenging hike that you all want to accomplish by the end of the year. Another fun way to get everyone out of the house together is to hop on your bikes. From your youngest kid to your oldest teenager, biking is an excellent workout that allows you to spend more time in the outdoors. Be sure to wear your helmets and opt for safe routes. If you have a super young child, you might want to invest in a carrier to prevent them from getting too tired. You can even start out with a simple bike ride around the neighborhood. Pedal your family into better health with a few bike rides a week. Finally, make it a point to start visiting all your nearby parks. Create a list as a family of the parks in your area and check them off one by one. From swinging to climbing on jungle gyms to a simple walk around a pond, parks allow us all to stretch our legs and get moving. Young kids, in particular, will find this an engaging activity and will require little motivation to get running. As you visit each park, make a note of which ones you all loved best. Keep a working list of all the parks in your area so that you can quickly hop in the car and head to a park on the weekend or during the evening time. While it isn’t always easy to find the time to fit physical activities into your day, it is a worthwhile venture. Keeping active is critical to the health of your whole family. You might face a little resistance at first if your family isn’t used to a routine of physical activity, but over time you can all build healthy habits together. Remember, being physically active doesn’t need to be super involved. Start with something small and work your way up from there. As your local primary care physician in Bee Cave / Austin, we are passionate about helping you and your family stay healthy. Come visit us today with any questions you might have about keeping your whole family well. We will be happy to help!